The Ancient Christian Commentary on Scripture does what very few of today's students of the Bible could do for themselves. With the aid of computer technology, the vast array of writings from the church fathers—including much that is available only in the ancient languages—have been combed for their comment on Scripture. From these results, scholars with a deep knowledge of the fathers and a heart for the church have hand-selected material for each volume, shaping, annotating and introducing it to today's readers. Each portion of commentary has been chosen for its salient insight, its rhetorical power and its faithful representation of the consensual exegesis of the early church. The Ancient Christian Commentary on Scripture is an ecumenical project, promoting a vital link of communication between the varied Christian traditions of today and their common ancient ancestors in the faith. On this shared ground, we listen as leading pastoral theologians of seven centuries gather around the text of Scripture and offer their best theological, spiritual and pastoral insights. Today the historical-critical method of interpretation has nearly exhausted its claim on the biblical text and on the church. In its wake there is a widespread yearning among Christian individuals and communities for the wholesome, the deep and the enduring. The Ancient Christian Commentary on Scripture does not seek to replace those excellent commentaries that have been produced in the twentieth century. Rather, it supplements them, framing them with interpretive voices that have long sustained the church and only recently have fallen silent. It invites us to listen with appreciative ears and sympathetic minds as our ancient ancestors in the faith describe and interpret the scriptural vistas as they see them. The Ancient Christian Commentary on Scripture is a postcritical revival of the early commentary tradition known as the glossa ordinaria, a text artfully elaborated with ancient and authoritative reflections and insights. An uncommon companion for theological interpretation, spiritual reading, and wholesome teaching and preaching. For the early church fathers the prophecy of Isaiah was not a compendium of Jewish history or theology but an announcement of the coming Messiah fulfilled in the life and ministry of Jesus of Nazareth. As such, the prophet's words were a rich source of theological reflection concerning their Lord and a vital aid in their defense against the objections of the Jews that Jesus was the promised Messiah. The interpretation of Jesus' ministry in light of Isaiah's prophecy was not a theological innovation on their part, but rather a following of the path blazed by the New Testament writers and Jesus himself. Among passage-by-passage commentaries cited here are those by Eusebius of Caesarea, Jerome, Cyril of Alexandria and Theodoret of Cyr, as well as one attributed to Basil of Caesarea. John Chrysostom preached a series of homilies on Isaiah of which most of those extant concern the first eight chapters, though Chrysostom frequently cites Isaiah in numerous homilies on other books. Augustine of Hippo, Gregory the Great and Bede the Venerable frequently cited passages from Isaiah 1—39 as did many other fathers in defending the Christian faith from Jewish critics. 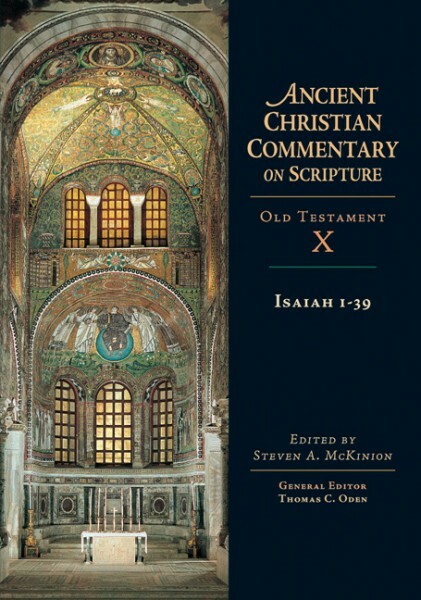 Edited by Steven A. McKinion, this volume of the Ancient Christian Commentary on Scripture offers readers access to materials ranging from East to West and from the first through the eighth centuries, some appearing in English translation for the first time. Within this treasure house are riches to illumine the mind and fire the heart. This volume can be purchased individually or as part of the Ancient Christian Commentary on Scripture (ACCS) Set.